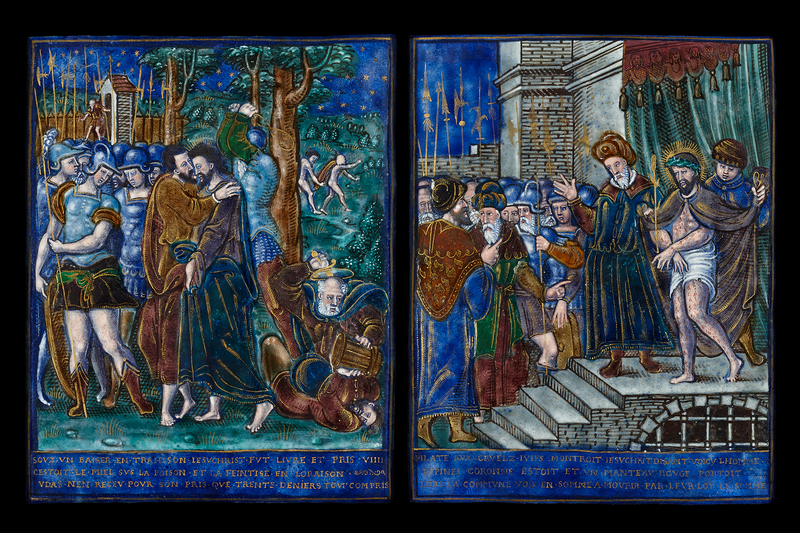 These two enamels are excellent examples of how artists from Limoges employed local sources for the creation of didactic series of fine painted enamels. 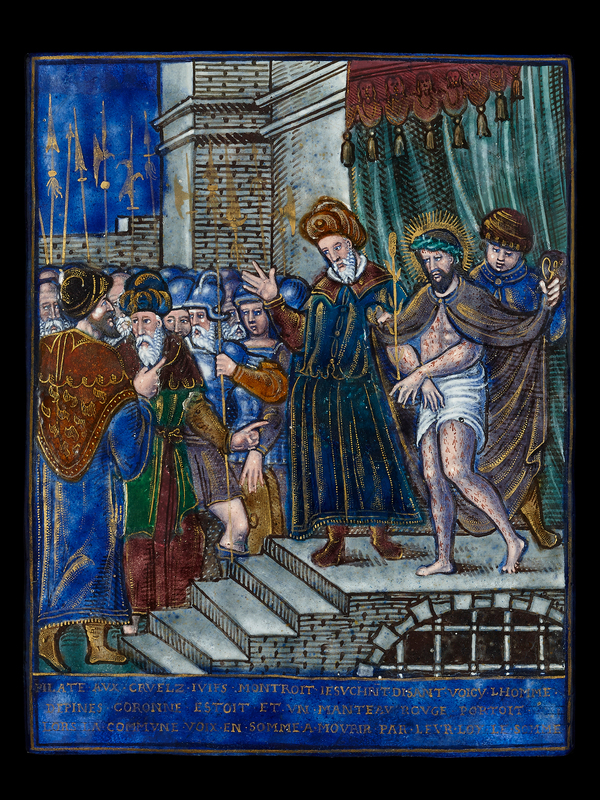 Not only are the compositions of the Betrayal of Christ and Ecce Homo based on Bernard Salomon’s woodcuts in the Figures du Nouveau Testament, published by Jean de Tournes in Lyon in 1556, the enameller and his patron also made the rare choice to fully incorporate the six-line poems by Charles Fontaine that appear underneath each print in the same book. 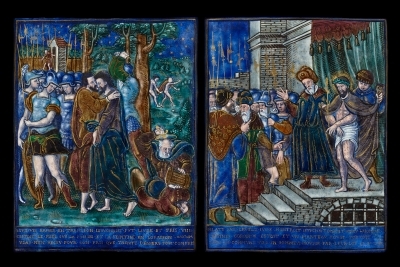 The enamels closely resemble the work of Pierre Reymond (1513–1584), the most prolific of the 16th-century enamellers, but the inclusion of paillons, pieces of foil underneath translucent enamel, at the sleeves and waist of the soldier on the left of the Betrayal suggests that one of his sons and successor, Jean I, is responsible for the pair. 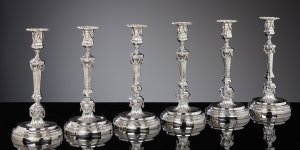 The closest comparisons for the present scenes can be found in the Musée des Arts Décoratifs in Paris and the Taft Museum in Cincinnati. The former museum houses a pair of enamels monogrammed IR for Jean Reymond. They represent the Betrayal of Christ and the Crucifixion but were modelled after Albrecht Dürer’s Small Passion as opposed to Bernard Salomon’s examples and are substantially larger at 29 centimetres (Blanc, op.cit.). In all enamels we see the woolly black outlines of figures and architecture, the brickwork, and the somewhat stern, narrow faces with white enlevage contrasting black facial features that generally point towards the Reymond workshop. Here too, however, we see the use of foil under translucent enamel to create a broader, more brilliant colour palette. 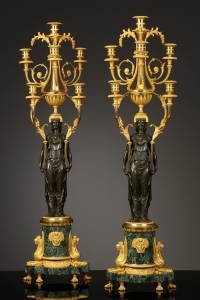 This technique seems to have been abandoned by the mid-16th-century generation of Pierre Reymond and Leonard Limousin but was very much in vogue both around 1500 and 1600. As opposed to some of his contemporaries, Jean Reymond uses these paillons sparsely, only highlighting certain items of clothing or parts thereof. 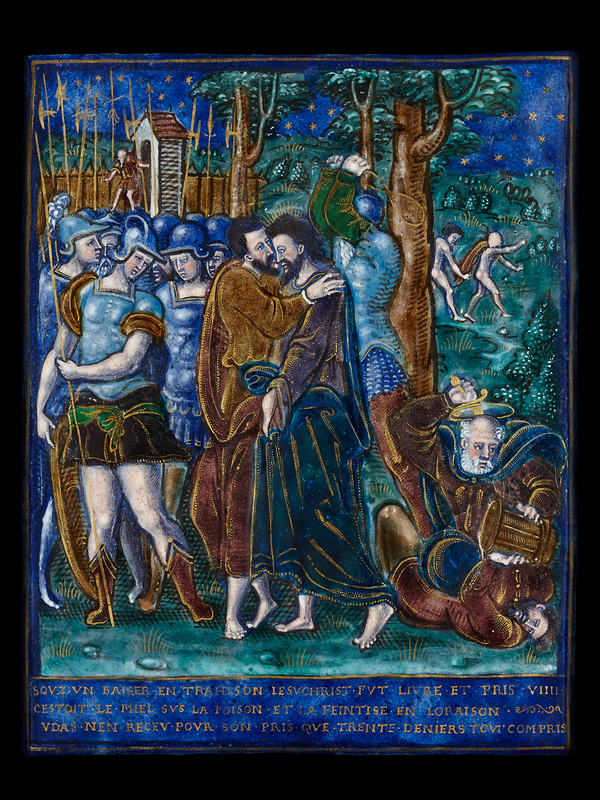 What also distinguishes Jean Reymond within the Reymond workshop is the profuse gilding, which he uses in a combination of lines and stippling for his highlights but also for weaponry such as the lances seen in both the present Betrayal of Christ and the Paris version. 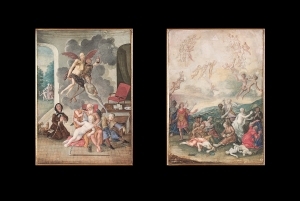 Two smaller scale enamels of Passion scenes by Jean Reymond are in the Taft Museum of Cincinnati (Verdier, op.cit.). As with the Parisian pair of enamels the colouration is strikingly similar: ultramarine, forest green, andbrandy brown dominate the composition, which is then enlivened with white, gilding and a few paillons. The skin tone is occasionally a little reddish. The colours, especially the blue, are deliberately not uniform, but display a lively variegation that gives a convincing sense of depth. Jean de Tournes (1504–1564) was a protestant from Lyon who founded a printing business in 1542. He is credited with the publication of some of the most influential illustrated books of the second half of the 16th century, including the Figures du Nouveau Testament (1556) from which the models used for these enamels were taken as well as Aesop’s Fables (1547) and Ovid’s Metamorphoses (1557). In addition he launched the careers of several contemporary poets and edited the works of Dante, Petrarch and Vitruvius for his French readers. Jean de Tournes’ success and influence earned him the title of Imprimeur du Roi in 1559. De Tournes usually employed another inhabitant of Lyon, the engraver Bernard Salomon, to fashion his small-scale illustrations in the elegant Mannerist style of the School of Fontainebleau. Despite the enormous influence of his engravings and documented commissions from Ippolito d’Este and King Henry II of France in the 1540s, surprisingly little is known about Salomon’s life. C. Fontaine, Figures du Nouveau Testament, Lyon, 1556, unpaginated; P. Verdier, European decorative arts, cat. The Taft Museum, Cincinnati, New York, 1995, pp. 392-393; M. Blanc, Émaux peints de Limoges, cat. Musée des Arts Décoratifs, Paris, pp. 178-181, no. 45.